In the MS-Windows 8/8.1 Explorer navigation pane (folder tree) you can quite fast hide or display the Favorites! To add this to desktop, like an: ... Windows 8 desktop shortcut! How can I deactivate the Windows 8 Favorites in the navigation pane (folder tree view show)? Windows-8 - FAQ-93: How can I deactivate the Windows 8 / 8.1 Favorites in the navigation pane (folder tree view show)? Deactivating webcam in windows 8? Cannot manage favorites in Win 8.1? Windows 8 can't see favourites list in folder options? Windows 8 folder tree view? Display of favourites index on windows 8? How to deactivate easy windows 8? Can I Deactivate Windows 8? Deactivate scaling global windows 8.1? Lost my favourites on screen in win 8.1? Can i remove favorites in tree view on Win-8? Win 8.1 navigation pane remove user folder? 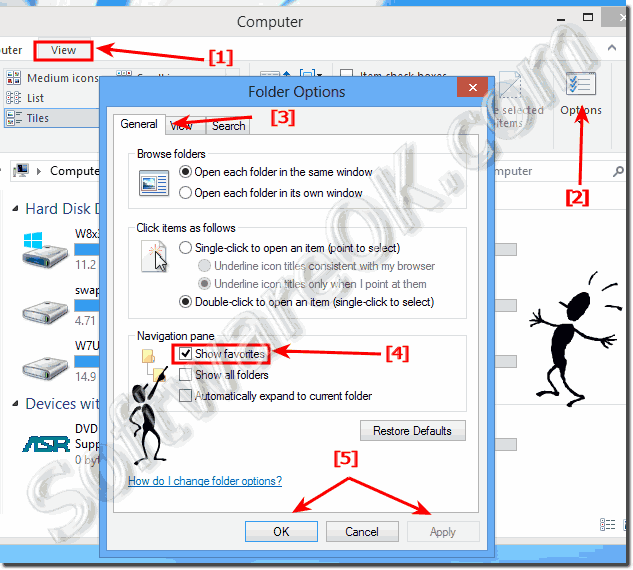 How to turn-off the Windows-8 favorites in right pane?